The Golden Gate Bridge is a suspension bridge spanning the opening into the San Francisco Bay from the Pacific Ocean. 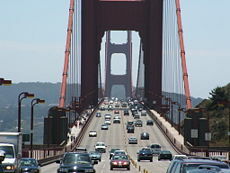 It connects the city of San Francisco on the northern tip of the San Francisco Peninsula to Marin County as part of US Highway 101 and California State Highway 1. The Golden Gate Bridge was the largest suspension bridge in the world when it was completed in 1937 and has become an internationally recognized symbol of San Francisco and the United States. It is currently the second longest suspension bridge in the United States after the Verrazano-Narrows Bridge in New York City. The bridge is widely considered one of the most beautiful examples of bridge engineering, both as a structural-design challenge and for its aesthetic appeal. It was declared one of the modern Wonders of the World by the American Society of Civil Engineers. The allure of the Golden Gate Bridge is not only for the photographer and others who appreciate its majestic beauty, but also for those seeking to commit suicide from its heights. When the official suicide count ended in 1995, over 1,300 suicides had leaped from the bridge, averaging one suicide jump every two weeks. Although a suicide barrier has been proposed, opponents argue that a barrier would be unsightly, too costly, and would simply move suicides elsewhere. Sunset view of the bridge as it spans the Golden Gate Strait. The Golden Gate is considered the world's most photographed bridge. The crossing of the Golden Gate Strait was for many years accomplished by a ferry running between the Hyde Street Pier in San Francisco and Sausalito in Marin County. The idea of a bridge to span the Golden Gate Strait was proposed by the engineer James Wilkins, and the bridge later earned its name in 1927, when it was referred to as such by San Francisco city engineer M. M. O’Shaughnessy. The bridge plan was the creation of Joseph Strauss, an engineer responsible for over 400 drawbridges, though they were far smaller than this project and mostly inland. Beginning in 1921 with his first drawings, Strauss spent over a decade gathering support in Northern California. Strauss' initial design comprised a massive cantilever on each side connected with a central suspension segment. To commemorate Joseph Strauss for his part taken in the construction of the bridge, a statue of him was relocated in 1955 near the structure to remind people how important his work was in the bridge's planning and construction. Other key figures in the bridge's construction include architect Irving Morrow, responsible for the Art Deco touches and the choice of color, engineer Charles Alton Ellis, and bridge designer Leon Moisseiff, who collaborated on the complicated mathematics involved. The initial cost estimate was $27 million. In May 1924, a hearing, through a petition, was heard by Colonel Herbert Deakyne in a request to use land for the construction of the Golden Gate Bridge. Colonel Deakyne, in the Secretary of War's name, approved to give the land needed for the bridge structure in both San Francisco and Marin counties pending further bridge plans by Mr. Strauss. The Golden Gate Bridge and Highway District was incorporated in 1928 as the official entity to design, construct, and finance the bridge. The district includes not only the City & County of San Francisco, and Marin County, in whose boundaries the bridge sits, but also Napa, Sonoma, Mendocino and Del Norte counties. Representatives from each of the six counties sit on the District's Board of Directors. Voters within the District approved funding for the project in 1930 through a special bond issue that put their homes, farms, and business properties up as collateral. This bond issue raised the initial $35 million to finance the building of the Bridge. Construction began on January 5, 1933. The construction budget at the time of approval was $30.1 million, but actual construction costs totaled $36.7 million, resulting in a cost overrun of 22 percent. The last of the construction bonds were retired in 1971, with $35 million in principal and nearly $39 million in interest being financed entirely from tolls. Strauss, a graduate of the University of Cincinnati, placed a brick from his alma mater's demolished McMicken Hall in the south anchorage before the concrete was poured. The center span was the longest among suspension bridges until 1964 when the Verrazano-Narrows Bridge was erected between the boroughs of Staten Island and Brooklyn in New York City. 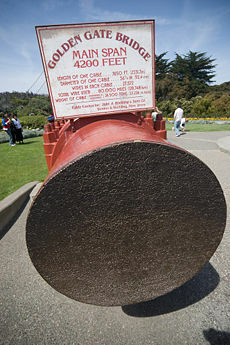 The Golden Gate Bridge also had the world's tallest suspension towers at the time of construction, and retained that record until more recently. In 1957, Michigan's Mackinac Bridge surpassed the Golden Gate Bridge's length to become the world's longest two-tower suspension bridge in total length between anchorages. The longest center suspension span in the world and the longest, two-tower suspension bridge between anchorages is currently the Akashi-Kaikyo Bridge in Japan. A unique aspect of the bridge's construction was the safety net set up beneath it, significantly reducing the expected number of deaths for such a project. Eleven men were killed from falls during construction, and approximately 19 men were saved by the safety net. Ten of the deaths occurred near completion, when the net itself failed under the stress of a scaffold fall. The 19 workers whose lives were saved by the safety nets became proud members of the (informal) Halfway to Hell Club. Weeks of civil and cultural activities called "the Fiesta" surrounded the opening of the bridge, completed in April 1937 and opened to pedestrians on May 27 of that year, Mayor Angelo Rossi presiding. The next day, President Roosevelt pushed a button in Washington, DC signaling the official start of vehicle traffic over the Bridge at noon. When the celebration got out of hand, the SFPD had a small riot in the uptown Polk Gulch area. Approximately 100,000 vehicles use the bridge each day. As the only road to exit San Francisco to the north, the bridge is part of both U.S. Route 101 and California State Route 1. On an average day there are 100,000 vehicles crossing the bridge. The bridge has six total lanes of vehicle traffic, and walkways on both sides of the bridge. The median markers between the lanes are moved to conform to traffic patterns. On weekday mornings, traffic flows mostly southbound into the city, so four of the six lanes run southbound. Conversely, on weekday afternoons, four lanes run northbound. The eastern walkway is for pedestrians and bicycles during the weekdays and during daylight hours only, and the western walkway is open to bicyclists on weekday afternoons, weekends, and holidays. The speed limit on the Golden Gate Bridge was reduced from 55 to 45 miles per hour on October 1, 1983. Since its completion, the bridge has closed due to windy conditions five times; 1951, 1982, 1983, 1996, and 2005. The 1982 event in particular was severe enough to set the bridge in visible motion, undulating in a motion somewhat reminiscent of the catastrophic "Galloping Gertie" in Washington State. Live load capacity per lineal foot: 4,000 lbs. As an example of how the Bridge is built to move, during the winter storms in 1982, the main span bowed approximately 6 to 7 feet. The transverse deflection is due to a sustained transverse wind load. The maximum transverse movement of 27.7 ft is based on the maximum allowable longitudinal movement of the wind locks at the support towers. 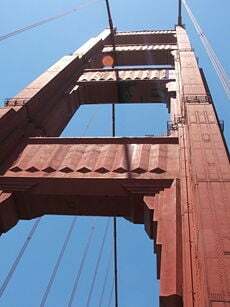 The Golden Gate Bridge has two main towers that support the two main cables. To build the pier to support the south tower, construction workers pumped 9.41 million gallons out of the fender that was constructed first. and are secured at either end in giant anchorages. The main cables rest on top of the towers in huge, steel castings called saddles. Diameter of one main cable with wrapping: 36 3/8 in. The wire comprising each main cable was laid by spinning the wire using a loom-type shuttle that moved back and forth as it laid the wire in place to form the cables. The spinning of the main cable wires was completed in six months and nine days. The color of the bridge is an orange vermilion called International orange, which was selected by consulting architect Irving Morrow because it blends well with the natural surroundings yet enhances the bridge's visibility in fog. The bridge is widely considered one of the most beautiful examples of bridge engineering, both as a structural-design challenge and for its aesthetic appeal. It was declared one of the modern Wonders of the World by the American Society of Civil Engineers. According to Frommer's travel guide, the Golden Gate Bridge is "possibly the most beautiful, certainly the most photographed, bridge in the world." Aesthetics was the foremost reason the first design of Joseph Strauss was rejected. Upon re-submission of his bridge construction plan, he added details, such as lighting to outline the bridge's cables and towers. The aesthetics of the bridge are also cited as a prime reason not to erect a suicide barrier on the bridge. The bridge was originally painted with red lead primer and a lead-based topcoat, which was touched up as required. 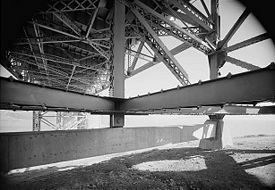 In the mid-1960s, a program was begun to improve corrosion protection by stripping the original paint and repainting the bridge with zinc silicate primer and, originally, vinyl topcoats. Acrylic topcoats have been used instead since 1990 for air-quality reasons. The program was completed in 1995, and there is now maintenance by 38 painters to touch up the paintwork where it becomes seriously eroded. 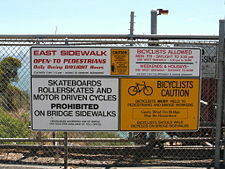 Signs prohibit pedestrian traffic at night and limit bicycle access. The Golden Gate Bridge is a notorious site for suicide. The official suicide count ended in 1995 when the number approached 1,000. In the eight years preceding 2003, there was an average of one suicide jump every two weeks, which brought the unofficial total to over 1,300 suicides. There were 34 confirmed bridge jump suicides in 2006, in addition to four jumpers whose bodies were never recovered and various unwitnessed deaths that appeared to be suicides but could not be confirmed. The California Highway Patrol removed 70 apparently suicidal people from the bridge that year. 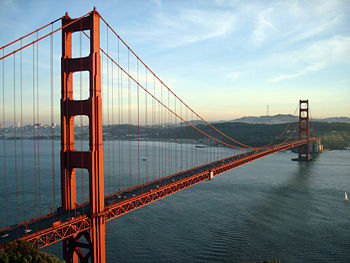 Currently, it is said that a person jumps off the Golden Gate Bridge every 15 days. The 220-foot fall from the bridge takes four seconds and jumpers hit the water at 75 miles per hour. As of 2006, only 26 people are known to have survived the jump. Methods have been discussed to reduce the number of suicides. One policy already introduced is to close the bridge to pedestrians at night. Cyclists are still permitted across at night, but they have to be buzzed in and out through the remotely controlled security gates. Attempts to introduce a suicide barrier have been thwarted by engineering difficulties, high costs, and public opposition. ↑ Golden Gate Bridge - Museum/Attraction View. www.frommers.com. Retrieved July 5, 2007. ↑ Cecil Adams "Could you jump off a bridge or a tall building and survive the fall?" www.straightdope.com. Retrieved July 5, 2007. The official website of the Golden Gate Bridge. goldengate.org. Gate Bridge Visitor Guide. tripsavvy.com. History of "Golden Gate Bridge"